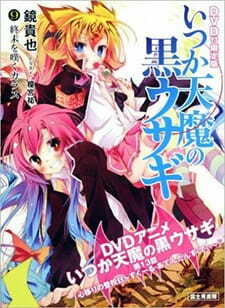 Ok, so I've just finish watching this OVA of the original anime "Itsuka Tenma no Kuro Usagi" and I must say that it is really funny, as usual the genre of its original anime doesn't apply anymore, the only genre that were maintained for this OVA are school, magic and a little bit of romance. The comedy is the main genre of this anime since it is all about Mirai's misadventures and the chaos she has sowed via soul transfer co'z she has mistaken the bottle filled with green stuff which she has for something good to drink. So for the story I'll give it a "Good" number 7, the art, since it is still the same as the ones used from the original anime a "Mediocre" number 5 will do- as usual on my part, the sound, hummmmmm, since there is a new ending theme played I'll give it a "Good" number 7. Since, The characters are still the same with the addition of the 2 guys from the previous original anime who are now students in the same school where Taito and Himea are attending and also under supervision of Gekkou. Enjoyment and Overall: Good 7. Well the story of a one episode OVA isn´t really what most people come looking for, but never the less, it is there, or at least in a way. Most of the OVA concentrates on a familiar concept of body-switching, which ultimately leads to some comedy moments, however the setting of it all is focused purely on the Itsu-Ten world which is kinda disappointing, considering this is (or at least should have been) a crossover between two different anime. And despite the cheap laughs the fans of the first show will definitely get, the same can´t be said about the DenYuuDen part of the crossover (though I guess you´ll get cheap laughs too), since the DenYuuDen part takes up pretty much the last 5 minutes of the whole OVA, which might bring some people (me included) to question, why did they even bother making a crossover when one show gets a whole episode and the other is just filling up time till the credit-roll. Personally I´d ditch the crossover and make 2 separate OVAs for both series which would probably please way more people than what the authors did here, but hey, not my call. Comparing this crossover to those that came before it would be really cruel to it´s final grade since I think it lacked a bit (or a lot) on the whole “crossover” concept. One could easily see the DYD part as one of those short, leftover-time-consuming, mini shows that the old anime used to have at their end, which is not bad, but if you plan to watch it for the DYD part, you´ll just enjoy the last 5 minutes, while those who watch it for Itsu-Ten get the rest. But if you don´t care either way or you like both shows, it´s a win/win.